From what I pick up in comments here and all over the web, "Journey's End" has already won the uncoveted award for "Best Show You Haven't Seen." An unfortunate honor? I was already a fan of the play from my introduction to it at the Shaw Festival two summers ago. Maybe I'm loyal to my first time, but I have to say I slightly preferred that production to the current Broadway incarnation, if only for the claustrophobia. 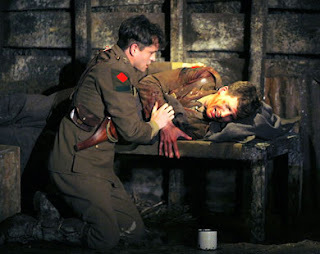 The original trench play, "Journey's End" really benefited at the Shaw from the intimate in-the-round staging in their smallest (300-seat) venue, on a minimal set of sandbags, box crates, and dirt that didn't even look like a set. That said, director David Grindley's new production at the Belasco (a recast remount of his West End success from a few seasons back) is still pretty impressive, and moving. It's not his fault, after all, he's stuck in a 1,000-seat house with a "dugout" even bigger than the New York Yankees'. The casualty of playing to such a size is felt mostly in the quiet first act, I found, where you really have to listen and focus, especially from far back, to pick up on all the subtle character interactions. But once you get to know these characters, the pressures put upon them in Act Two will probably get under your skin soon enough. It is also very well cast, with almost all American actors. The least impressive to me, funny enough--considering he's British--is Hugh Dancy as the achololic, embittered Captain Stanhope. Dancy basically hits the right notes, but the part seems to call for someone more obviously worn and almost past his prime as a star school athlete. (Part of the point of Stanhope's character is to show how a whole generation of Britain's potential future leaders--its "best and brightest"--were wasted and ruined by this war.) The youthful and slightly built Dancy has some trouble overcoming his preshow publicity as an up-and-coming Brit pretty boy. But he does have some stage chops, and does show the necessary hard edge by evening's end. A lot has been written about how familiar this old play seems, perhaps as a template for all corny old war movies. But what strikes me is how uncinematic it is. The battles, after all, are completely off stage. In movies--even "anti-war" movies--the sheer sight and thrills of battle can overtake the message. But in "Journey's End" the playwright, R.C. Sherriff (a real life vet), leaves us only with the scars. And mostly the psychological scars, at that. One death is marked only by an eerie disappearance. The other--see photo--is enacted, but briefly, and upstage in the dark. I'm tired of hearing this play described as "neither pro nor anti war" (usually by the pr-coached cast!). Because there is a clear and deliberate absence here of the one element that "redeems" war stories, even at their most bleak, and that is glory. There is no glory in "Journey's End." Like in the haunting poems of Sherriff's fellow disillusioned serviceman Wilfred Owen, it is hardly "Dulce et Decorum" to die for one's country here. People die randomly, not only without deserving it, but without cause. And the one man most miserable, who probably wants to die--the captain, no less--is doomed to live on and fight another day. There are no speeches about God and country. No reminder of the evils of the enemy. When one of the "Huns" is brought on captive, he's a scared clueless boy. Meanwhile, the superior officer seems irked at leaving his better outfitted tent to hand down certain-death orders to his middle-managers, and doubtful himself of the chances of ultimate victory--and he knows he'll likely get home in one piece either way. Committed mostly to a loving and faithful staging of the play, Grindley's most active, and activist, directorial choice is saved for the end. (Here beginneth the spoiler alert...) With a real war going on outside the fiction of the theatre, it wouldn't take much, you would think, to remind us of the play's "relevance". Grindley meets this responsibility head on and drives it home, though not in a way that can be accused of as "presentist" or updating. The play ends with a battle, the onstage death of a major character, and the exit of Captain Stanhope out into the shelling and machine gun fire. Grindley brings down the curtain in a slow fade as the script seems to call for. But just when you think the play's over and some even begin to applaud, the sound effects of the bombing get louder, and louder, and louder, until the safe old Belasco is shaking. It's a good minute of wordless though noisy darkness in the house, pretty long in stage time. Grindley is basically letting our minds wander to, ahem, whatever the sounds of explosions make us think about. Finally, at the point we're begging for relief, the bombs cross fade into birds chirping. Daylight. The nightmare over? Yes, until the curtain rises on a tableaux of the full cast, in full uniform, frozen like statues. Behind them is a wall of names. Freeze tableau for thirty seconds. Silence. That's the curtain call. No one moves. I've heard this move derided already (in comments on this blog, in fact) as pretentious, intrusive, or just "hitting over the head." But I was glued. First, Grindley manipulates the audience brilliantly in how he and his sound designer score the sequence. What really makes it effective, though, as political theatre, is how it's almost a Rorschach test. While I imagine the "wall" is based on an actual UK WWI monument, a US audience cannot not think of the Vietnam memorial. The moment both visualizes and enacts a war "memorial" to these men. (It also implies none of the characters escape the war alive.) It shows once again--as if we had to be reminded--that it is only an anti-war story that can truly "support the troops" then, or now. thanks for this. I hope it is going to run for awhile longer, I haven't caught it yet. Though I saw the Shaw production as well and absolutely fell in love with it. Kudos to whoever dug this play up a few years back and realized how powerful it could be for us now. The Court House Theatre was the perfect space though wasn't it? When I saw the show in early previews, after the curtain call with the cast in stillness, the lights came up twice more, each time with the actors less still, finally bowing like 'normal' at the end. I'm glad those extra moves have been cut - it's much more powerful not to give the audience the release of a regular bow. Hmm, Jaime. Now you've got me wondering if I've misremembered the ending. It's been a few weeks since I saw it, and your description seems eerily reminiscent to me. Could I have imagined and remembered the ending as better than it was?!? Anyone want to clarify for sure about the sequence of light cues and bows at the end? The lights come up with the tableau Playgoer describes. Then the lights go down. They come up again, with the same tableau, only now there is the most minor of bows (the removal of helmets).